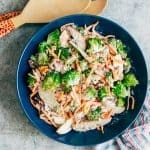 Creamy Apple Broccoli Walnut Salad – Make this ahead! 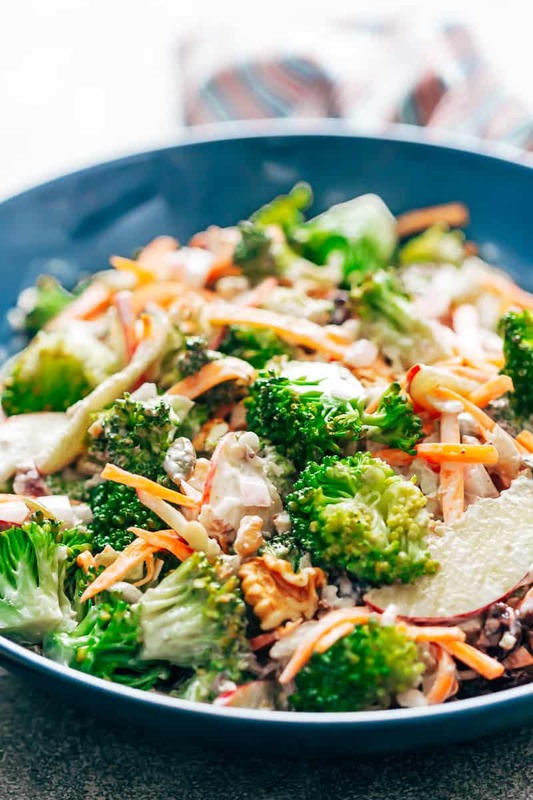 Creamy apple broccoli walnut salad really reminds everyone of a childhood favourite – waldorf salad. This salad is crunchy and so satisfying that I can usually finish a bowl all by myself! The dressing is made extra creamy with a combination of greek yogurt and mayonnaise so that its fresh, light and has half the calories. Meet my new favourite salad everybody. And I know that’s saying a lot because I just shared a mediterranean quinoa salad which I also love love love. But you know these two are different and have different reasons to eat them in my life. 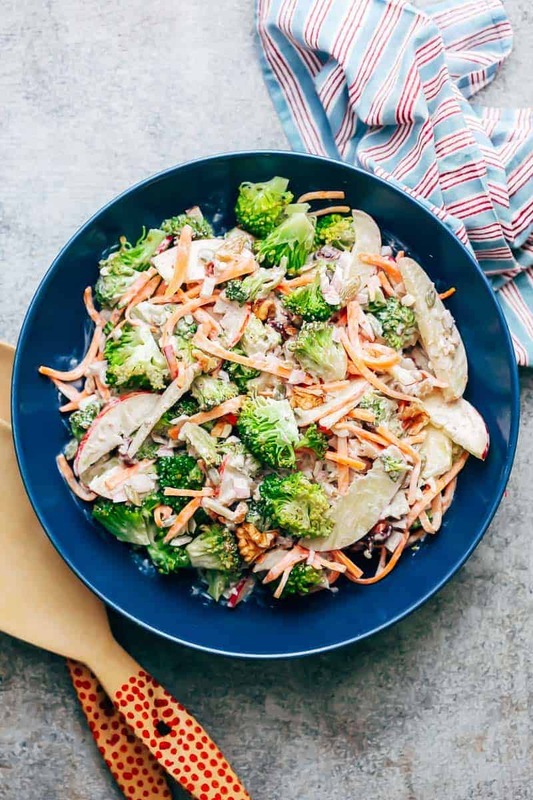 The quinoa salad is a lighter, hearty, carby but super nutritious kind of salad vs. this apple broccoli walnut salad that is incredibly satisfying because it has a delicious creamy dressing. And you will feel like you are consuming something that is borderline unhealthy but its so not because unlike all the other creamy salads of the world – this one has half the mayonnaise which is subbed with greek yogurt. Purrfeeeeect. We actually taste tested it with a bunch of friends when we shot the video for this recipe (see below) and there were fights about who is going to take leftovers home! That in my books, is a win my friends. A lot of broccoli salads use raw broccoli, but I prefer broccoli that’s lightly blanched, say for about 30 seconds. This takes away the raw flavour, gives broccoli a bright green colour, makes it safer too because vegetables like broccoli and cauliflower can sometimes have worms that can go unnoticed, and still keeps it crunchy. However, if you prefer to eat broccoli raw in salads, feel free to leave it raw. The salad is refrigerated for an hour before serving which will make the broccoli slightly tender naturally. We’ve used ‘washington apples’ in this recipe which are bright red, firm and really crunchy. But we’ve also tried this with a mix of tart green and sweet red apples and that tastes fantastic as well. Look for apples which don’t have bruises on the skin, are firm and don’t have any mushy pockets when you press them. 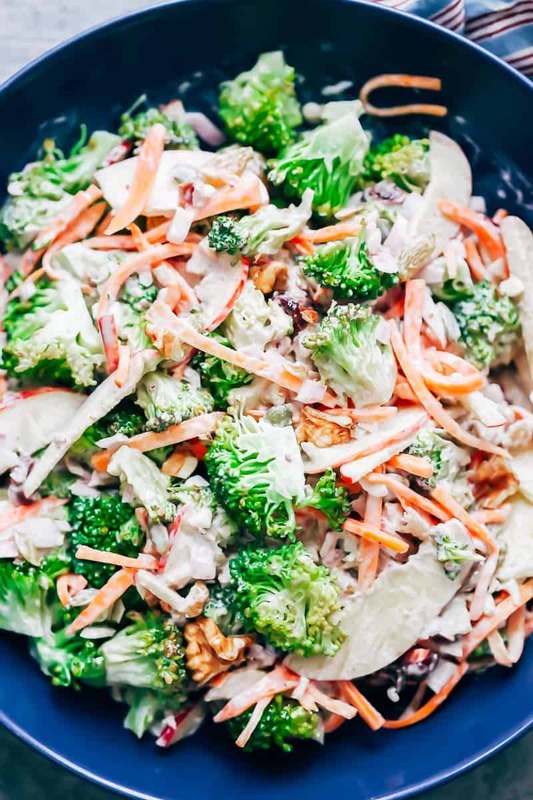 I love all the different colours and textures of this apple broccoli walnut salad. I know I’m going to make it for annual christmas lunch this year because it just feels like a winter salad. Watch the Recipe Video ABOVE to see step by step directions. This apple broccoli walnut salad is lighter, creamier but not mayo heavy. Its loaded with apples, broccoli, carrots, walnuts, onions, raisins, cranberries and pumpkin seeds. Its best to make this ahead and refrigerate for an hour before serving. Boil water in a pot and when it comes to a roaring boil, add the broccoli florets. Blanch them for exactly 30 seconds and strain them. Rinse them with cold water and set aside. To make the dressing, whisk together yogurt, mayonnaise, apple cider, honey and salt. To assemble the salad, toss together broccoli, carrots, apples, walnuts, onions, raisins, cranberries and pepitas (pumpkin seeds). Drizzle with dressing, and toss to mix well. Refrigerate for at least an hour before serving. I’m excited to try this. I will make a few changes. Since most salads of this type have too much dressing for me, I will cut back on the amount of dressing and use Helmann’s Light to cut back on calories. I also have to watch sodium and was shocked at the amount your nutrition list showed. I’ll use much less and probably use a salt substitute as well. I will also probably use it as a side dish so the serving size will be about half. These changes cut the calories to 178, the fat to 9 grams and the sodium to 86 mg. I sure hope it works! I hope the changes worked for you when you tried it! I am not a big fan of apples, but would LOVE to try them in this colorful and delicious salad. Adding broccoli and walnuts is a great idea. Thanks for the simple and yummy salad recipe.